I'm a day late, the boys turned 5 yesterday, oh boy that happened fast! When they were first born I hardly thought past 5 month because it was so hard but here we are 5 years later, crazy! They dwarf their premie onesies, oh my they were so tiny! Mama Elda (and Tia Aracely too) is in town so not much time to update the blog! The boys went in for their 5 year check up today. We are trying out a new doc that's just a few blocks from our house. It was pretty cool riding our bike to our check up! Everyone is super healthy as they always have been. Here are their stats and the crazy thing is they all weighed in at exactly the same weight! A couple weeks ago we went fishing and no one got skunked! Mr T looking sharp for Sunday meeting! The boys are in a local credit union commercial which is currently being aired. The whole thing took about 10 minutes to film and all they wanted from the boys was to capture some "cuteness." Check it out, but if you blink you'll miss it! CET first day of preschool! After a long summer with no parenting breaks I'm really looking forward to getting a few hours to myself every week! The boys started their last first day of preschool yesterday. About a year ago I wrote how I'd try to contest an early start to Kindergarten since they only missed the cut off by 28 days. As time went on I started to feel less sure that they'd be ready for it. Not only that I started to realize that there are social effects to starting early, like kids around them starting puberty before them and all that entails with that (eek!). I don't necessarily want my kids growing up too fast. Also it worry's me that because they are shorty's they might get picked on so that'd at least give them another year to be a little taller. Although, they can really hold their own when together, no would be crazy enough to mess with ALL three of them, ha! I also started to miss them just thinking that I wouldn't get another year to be with my babies! They are at such a fun age right now even though they still wear me out by the end of the day (thank goodness they still nap!). I decided not to reapply for Head Start, since we didn't qualify last year I figured we still wouldn't. I got excited when I found out there was this other free preschool program, according to their income charts we qualify so long as our kids are at least 4 by Sept 1st. I knew it was a Monday through Friday program, but later I found out it was an all day program and not half day as I believed it to be. It's funny because I would have put them in full day kindergarten if I thought they were ready but full day preschool sounds too much like daycare to me. And that's not what I want for my kids. Then late last week, in a strange turn of events, Head Start called me to see if I wanted to enroll the boys because they had space for a few over income families (I hadn't even applied!). It was a very tempting offer because it's Monday through Friday for 3 hours and they get either lunch or breakfast depending on if they are in the am or pm class (and not to mention its entirely FREE!). If it had been last year when the boys were still in the terrible three's I would have jumped on the opportunity but now at almost 5 I'm not so sure. I called back and they only had space in the am class which runs so early it'd be hard to get my errands done because a lot of places aren't open that early. Also the school is almost 2 miles away so it'd be a lot of driving back and forth. It was a tough choice but in the end we decided to stay with the preschool program they went to last year. It's about a mile away so we can either walk or bike if I don't have an errand to run off to. And it gives me a couple days a week to have the boys all to myself, which I especially like because we can continue with our Spanish home-school lessons. The boys will go three days a week for 2.5 hours and we are paying for it with a partial scholarship (thank goodness because other wise we could not afford it). They got a fresh new teacher and she's switching things up a bit so it should make for a fun and exciting year of learning! 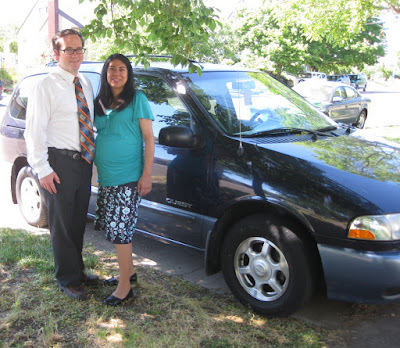 We are forever grateful to our friend Martha G who gave us the van that we brought our babies home in! It served us well for 5 years and helped us save up for our next car. The boys and I called it our "toot toot." We'll continue as a one car family so we'll have to bid farewell to it pretty soon. Our new (to us) Sienna! It was time for a new car because the 190K miles on our 1999 Quest was making us nervous even though it's been a pretty reliable car. Phil and I started our car search and were looking into buying a 2007-09 Sienna (because you just can't go wrong with Toyota!). After almost two months of stalking Craigslist we stumbled on a killer deal for this 2011 Sienna (clean title and all!). It was such a good deal that it justified spending a bit more than we wanted because it was so much newer and had fewer miles than we had expected to buy! It's crazy to believe that after being married for 11 years this is actually the first car Phil and I have ever bought together. Before our last van we had a Corolla that my parents gave me my sophomore year in college. Being that we are both so cheap frugal we always hated the thought of wasting spending too much money on a car, so we bought a house instead, ha! Anyways we are so happy with our purchase especially because its an 8 seater van so now we have room for three extra friends/family. Can't wait for our next visitors!